The flooded Bento Rodrigues village. 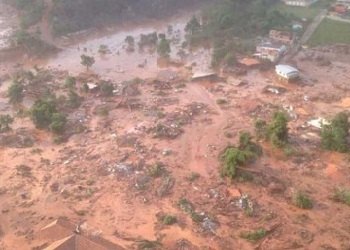 Following the collapse of the Fundão dam in Minas Gerais state on Thursday the boss of BHP Billiton is to arrive in Brazil today to assess the devastation caused by the collapse of the dam at an iron ore mine co-owned by BHP Billiton and Vale SA. Four people have been reportedly killed whilst roughly 28 are still missing, including 13 mine staff. The numbers include at least three children and an elderly woman in the village of Bento Rodrigues where just 10 of 200 houses were left standing. The disaster in the south-eastern state of Minas Gerais is directly north of Rio de Janeiro and has prompted a search and rescue operation involving about 500 people including firefighters and military attempting to find victims along the floodplain downstream from the dams. BHP said that its operation included a three-tiered dam construction which contained mine tailings, or waste. Within the development the Fundao dam failed which also affected the Santarem dam further downstream. The governor of Minas Gerais, Fernando Pimentel said at a news conference it was still not known what triggered Thursday’s failure of the dams, which unleashed a massive flood of mud, water and debris which destroying the majority of buildings in the village of Bento Rodrigues. Amid mounting criticism by environmentalists, officials and residents concerned how the dams were able to collapse, BHP chief executive Andrew Mackenzie is due to meet mine bosses and local authorities on Monday at the site of their operation. BHP Billiton and the Brazilian resources firm Vale SA both have 50 percent stake in Samarco, the mines operator. BHP and Vale shares both dropped by 5.7 percent in Fridays trade whilst BHP’s stock on the Australian stock market fell by an additional 3.5 percent on Monday. Both companies at the moment are facing issues due to the lowest iron ore prices in a decade.